Your model may differ slightly in appearance – but all the functions are exactly the same as this one ! 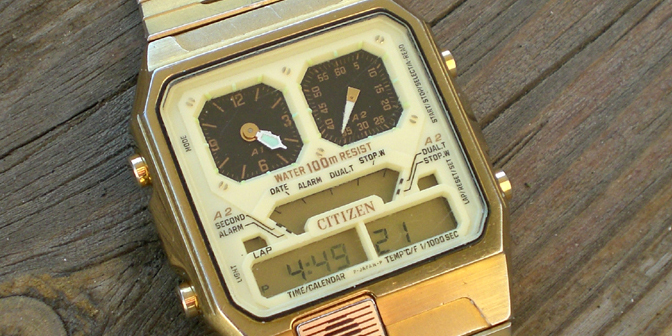 Following instruction manual applies to all CITIZEN Analog Digital Temperature Watches with Cal. No. 8980 8981 8982 8983 8984 and Cal. No. 8985 8986 8987 8988 8989…also applies to some of the later models ! If you don’t know your Caliber Number ? – check How to recognize a Caliber Number. M button MODE Switching of mode & instant manual return. S button SELECT Selection of digit for correction, switching of 2nd analog mode & start/stop stopwatch. R button RIGHT Correction, alarm ON/OFF, switching of sampling time for temperature measurement (1 sec/1 min. ), lap & reset (stopwatch). L button LEFT Illumination lamp. *( If your Citizen Ana Digi Temp is slowing down or runs too fast ? check – Adjusting Time ). *( If you feel that your Citizen Ana Digi Temp incorrectly indicates the Temperature ? be sure and check - Adjusting Thermometer ). *( If something else does not work properly – check the Damage Diagram below. 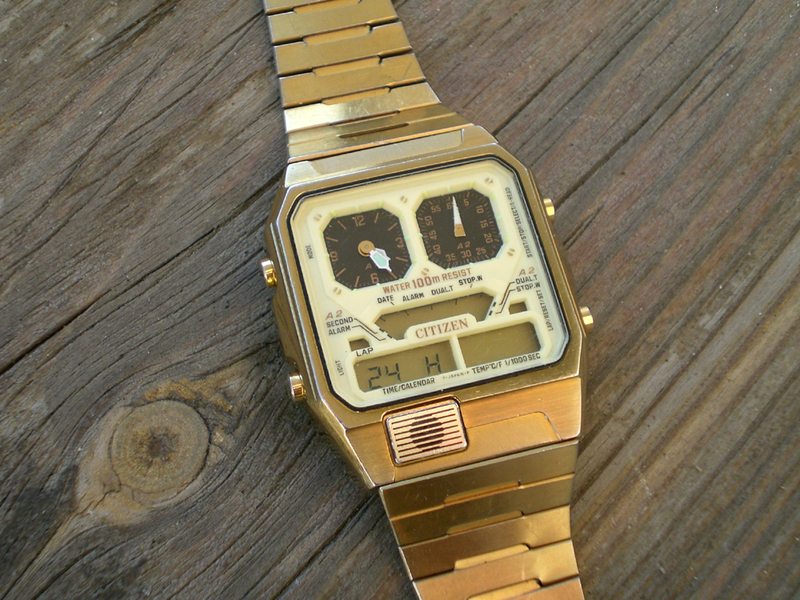 This will let you know what’s wrong with your watch and how to remedy it ). 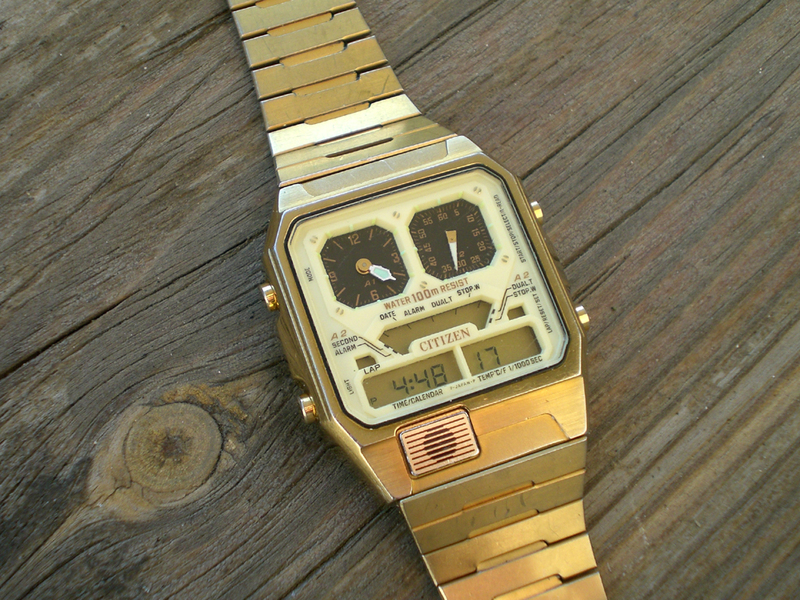 Before setting the Time – make sure that the watch Mode is Normal Time showing. * Not confuse the Normal Time Mode with the Local Time Mode, which is quite similar, but it has a symbol „L” – which means – Local Time Mark ( picture above ). A time setting mode is obtained by pushing „S” button for 1 second or longer. 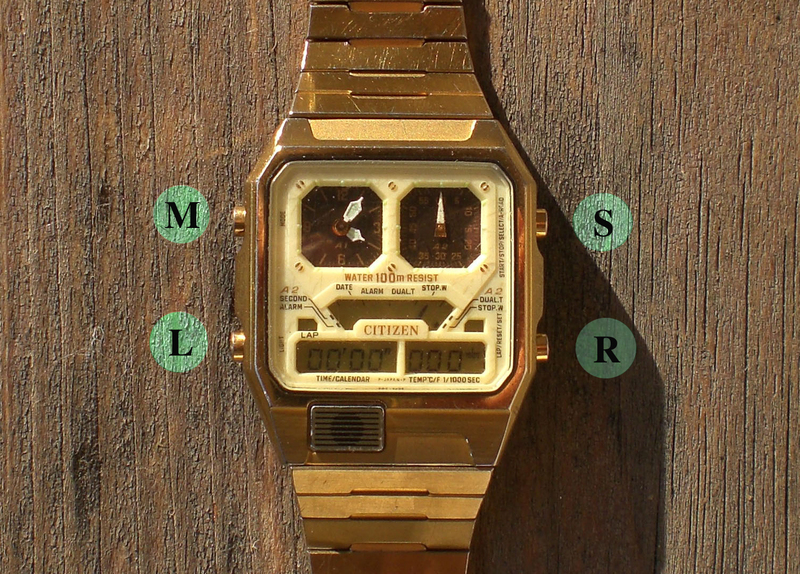 Note that The Seconds can be Simultaneously and Independently displayed by the 2nd Analog watch ( in the upper right corner of the watch ). From now the Digits Indicating The Seconds ( in the Digital Section – LCD display ) will blink ! 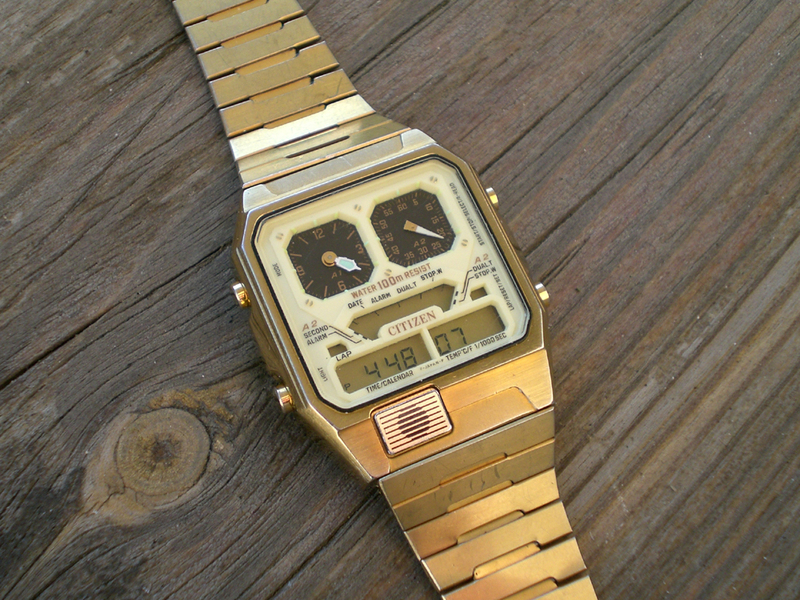 At this point, if you want you can reset seconds – compared for example with computer time or another watch. I adjust watches according to International Atomic Time * This is Highly Precise Time Scale that is Calculated using data from about 400 Atomic Clocks. 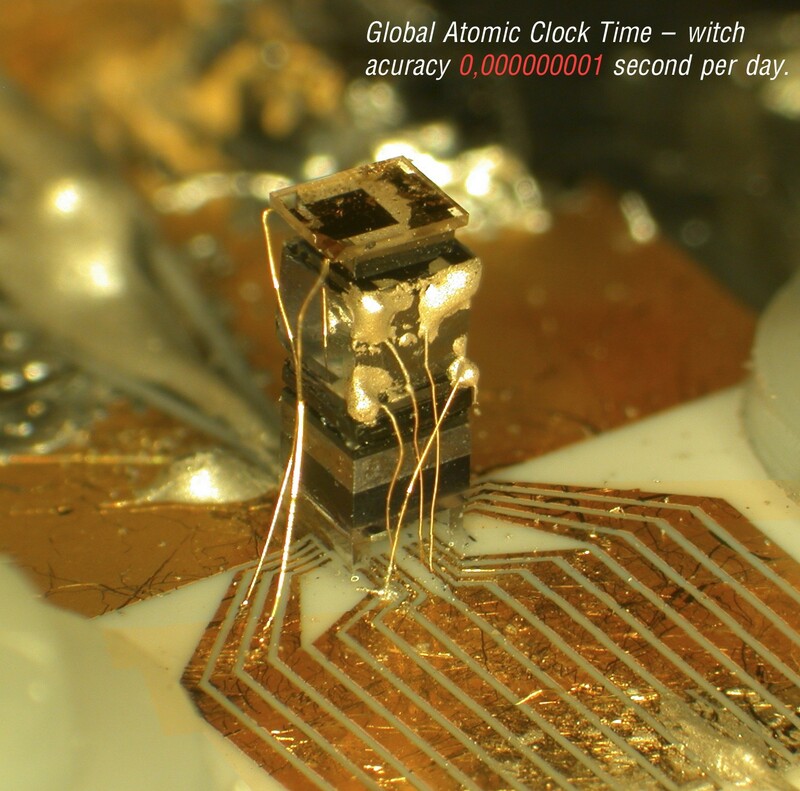 The Time it takes a Cesium-133 atom at the ground state to oscillate exactly 9,192,631,770 times per second !!! 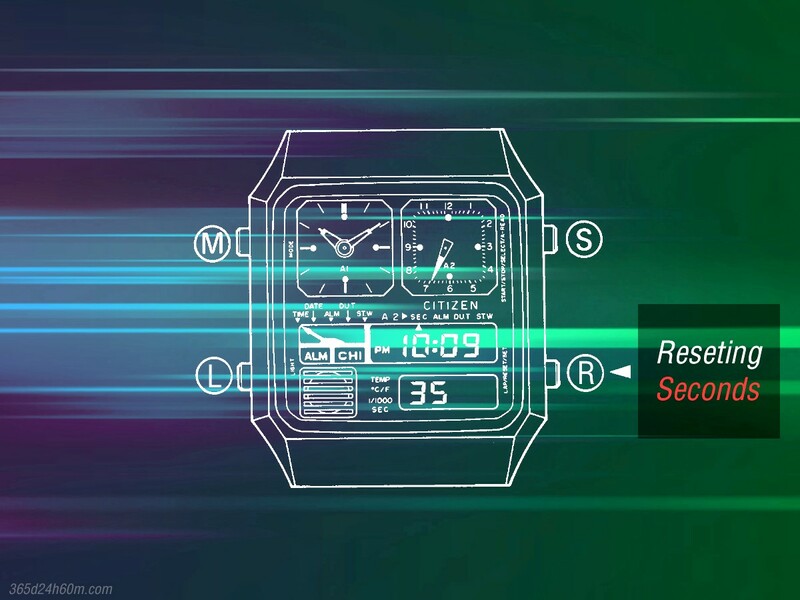 The seconds in our Watch are reset to zero „00″ with push of „R” button. 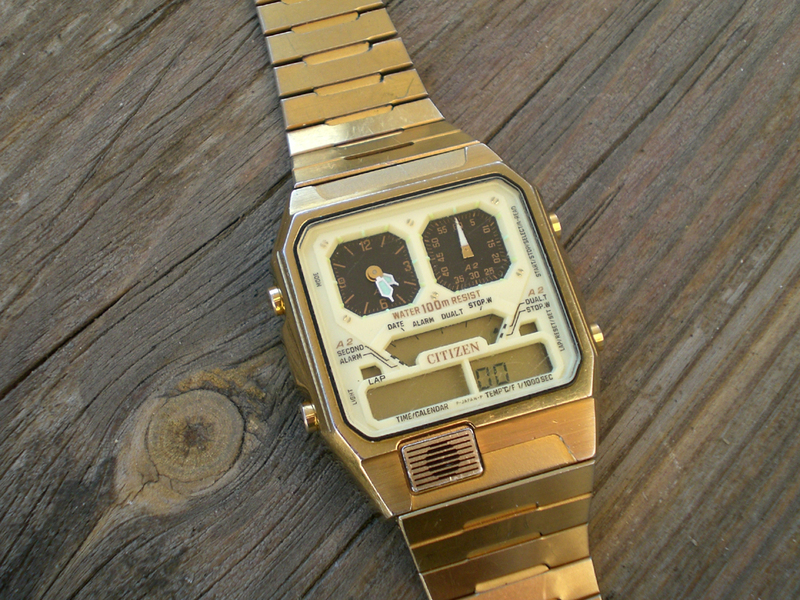 * Typically, wrist watches are rarely synchronized with ( Global Atomic Clock ) with an accuracy of one second. However, if you want to be super accurate – or you want to check if your watch is slowing down or runs too fast – then I recommend you to do this Reset ! As you can see ( picture below ) the LCD display shows 09 seconds, but 2nd analog watch shows 23 seconds ! Now LCD display shows 21 seconds and 2nd analog watch shows 36 seconds – picture below. Setting of minute and hour ( In my watch – left side of the LCD display ). If you’ve reset seconds compared with another clock ( described at the beginning of the chapter ) or even if you didn’t need to do that – press now „S” button – to go to set the minutes ( they will blink ). Minutes are set by „R” button. A quick setting ( of 8Hz ) is also possible witch push of „R” button for 1 second or longer. 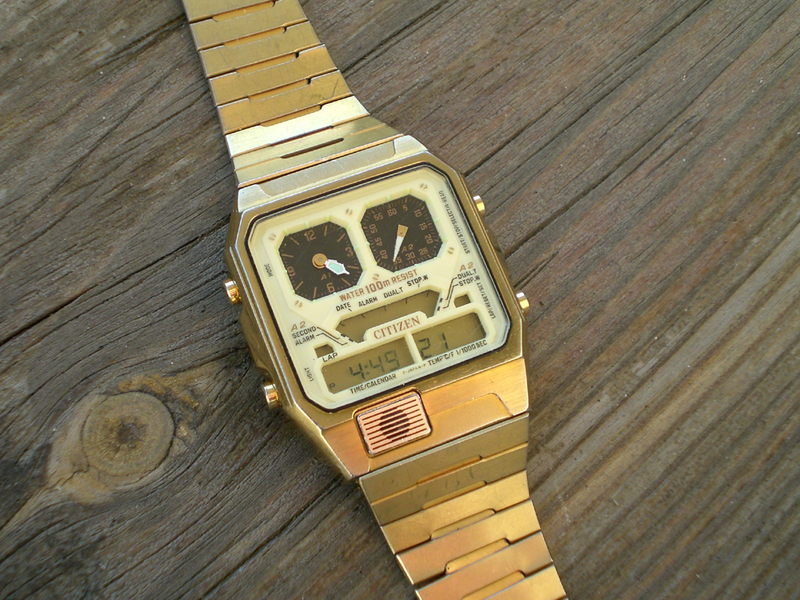 As you can see ( LCD Display – picture below ) – the „hour : minutes” section ( bottom left corner of the watch ) – now displays 4:49. To set the hours – repeat the procedure. Press „S” button ( hours start blinking ) and then pushing by „R” button set the appropriate hours. And after my adjustment, the „hour : minutes” section displays 5:51 . 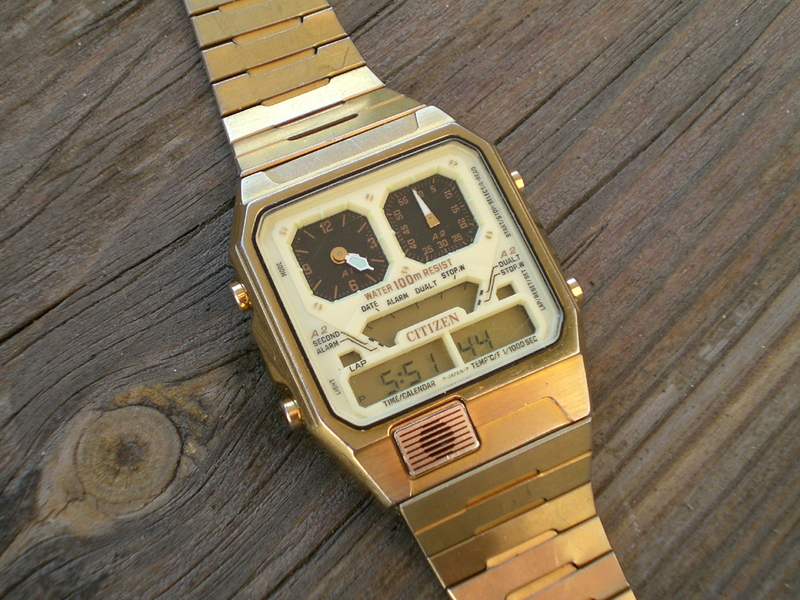 To finish setting the digital time watch, press again the „S” button – then go on to set the mode 12/24 hour format. and 24 H display mode – switch by pushing button „R” , as pictured below…. How to set 1st analog watch ? * Note … Is easy to overlook this moment !!! Now when you press „S” button – hours and minutes – LCD Display – will blink ( just like on my watch – picture below ), this means that we can set 1st analog watch – A1 ( the picture above ) !!! Push „R” button to precise correction 1st analog watch. One touch „R” button – moves only one step the minute and hour tips ! Also a quick correction ( of 64 Hz ) is possible witch push of „R” button for 1 second or longer. * You should adjust the Hour and Minutes on 1st Analog watch ( upper left corner of the watch ) – the same as they are now displayed on the Digital watch ( LCD display in the bottom left corner of the watch ) … similar to the picture below – more details. 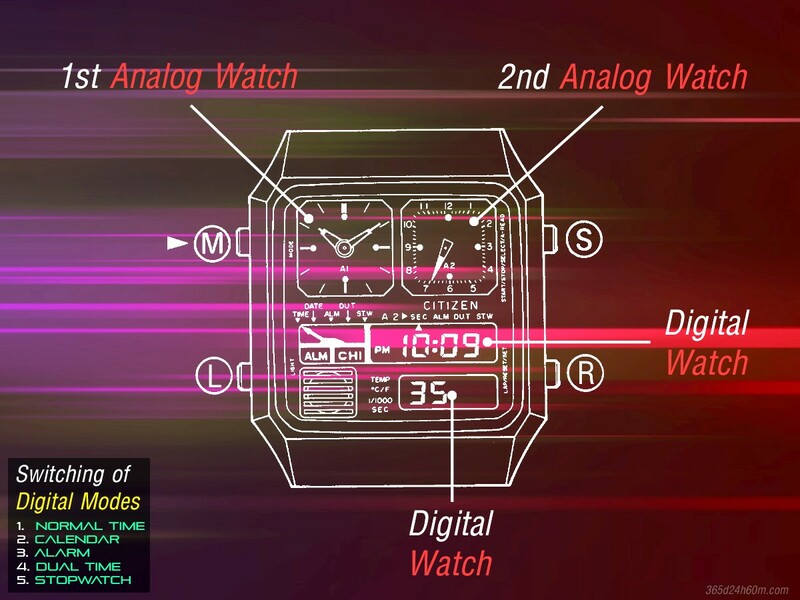 Setting of 2nd Analog Watch and Synchronization with Digital Watch ! 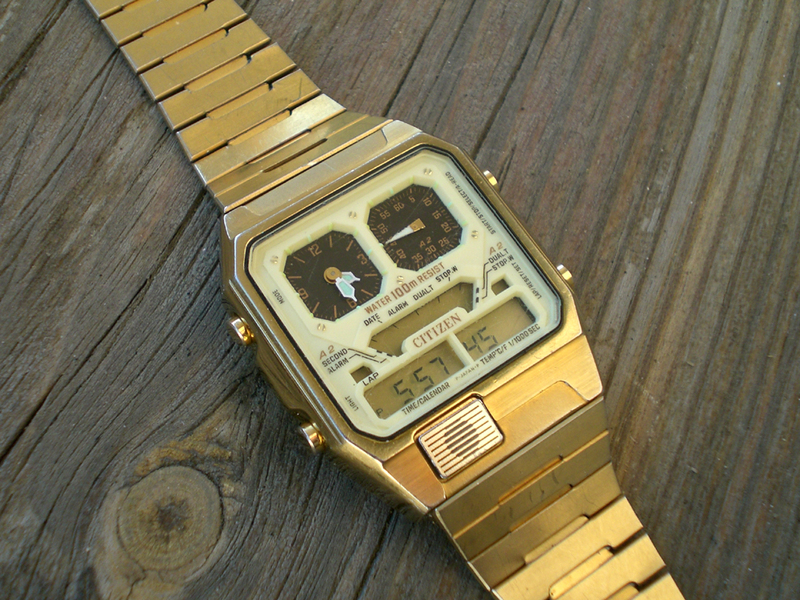 Do you remember…in my case the difference between digital watch and 2nd analog watch was 15 seconds ! By pushing „S” button we get into the Synchronization. 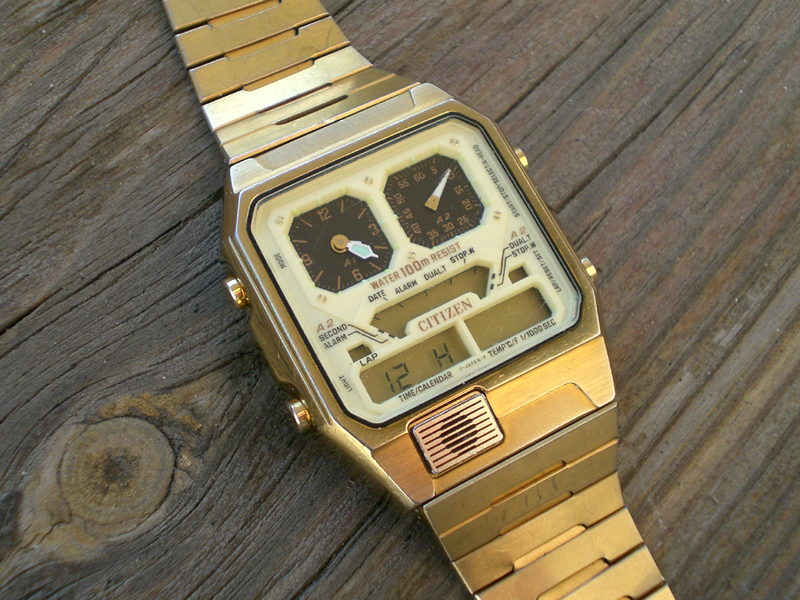 Note that at this point – display showing seconds ( bottom right corner of the watch ) began to blink, in addition it reset – showing the „00″ – see picture below. * I need to add that this reset is seeming „virtual” , does not apply to Real-Time. Time and second runs at their own speed ( inside the watch processor ), this evidence is that 1st Analog watch ( upper left corner ) still shows Real Time ( hour & minutes ), in my case 4 : 25 pm / 16 : 25 – see below. Although the Digital watch displays zero seconds, the real seconds reset ( for example, comparing with the other clock / smartphone ) we did at the beginning of setting time ! 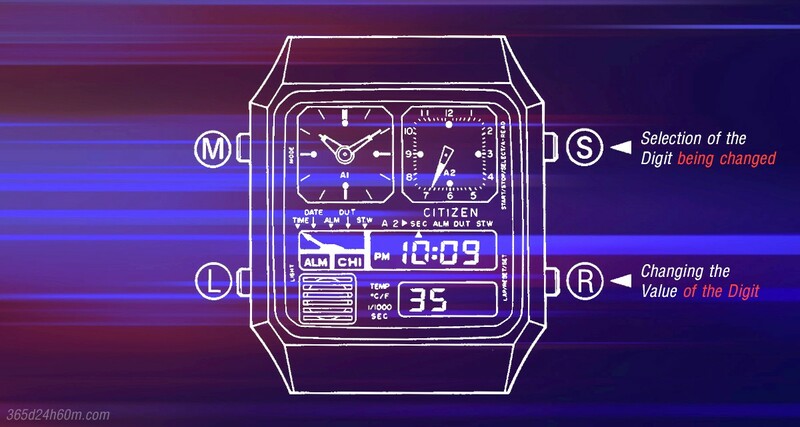 The digital watch has just been „virtual” reset. This is The First Step to Synchronization Digital Watch and 2nd Analog Watch ( A2 ) !!! Now we also have to „virtual” reset the 2nd analog watch ( That the watch tip would show Zero and more accurately it was at 12/24 o’clock ). 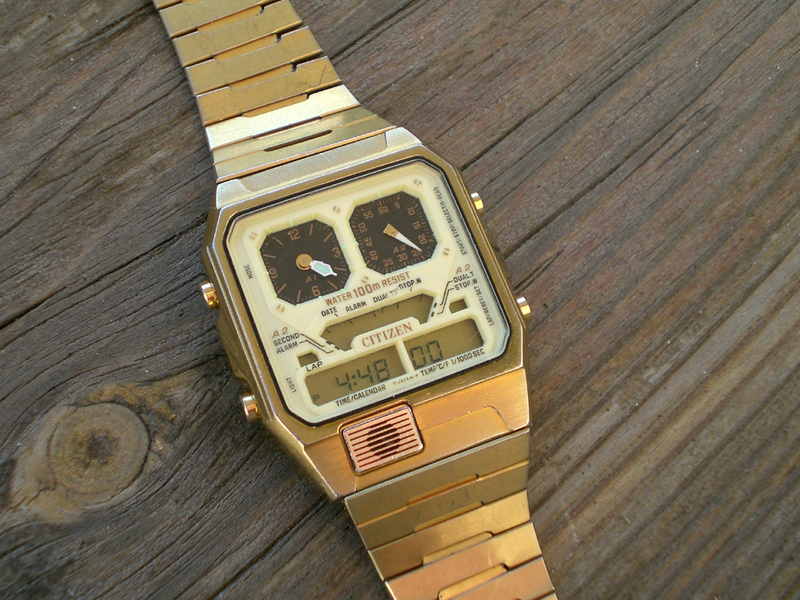 And so that later, the Digital and Analog watch would show the same seconds. 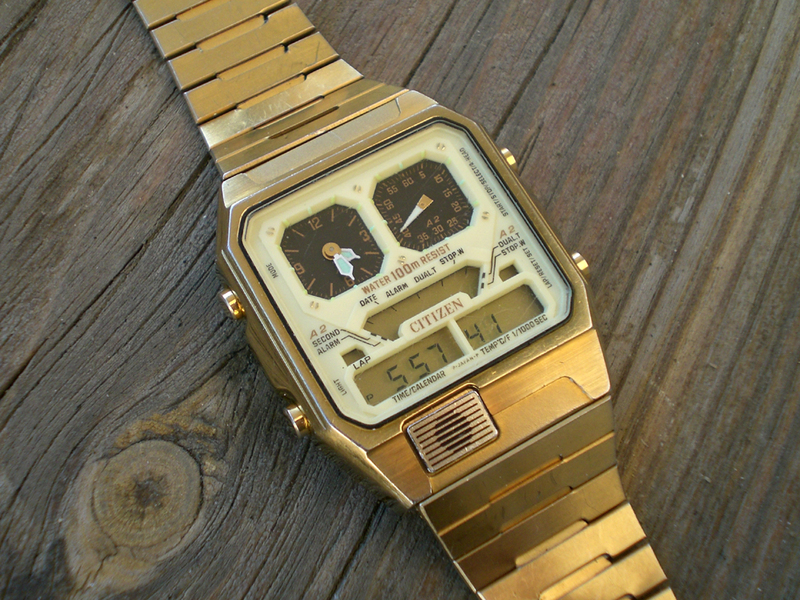 Digital watch is blinking, shows still „00″ is a kind of frozen :) … picture below. 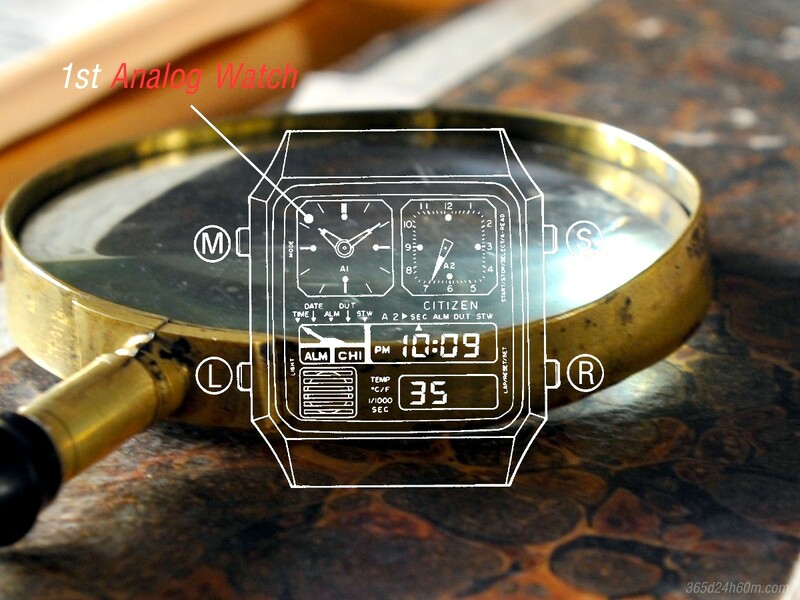 Now Push „R” button to precise set 2nd analog watch at the 12-o’clock position (00 – reset). As previously – one touch „R” button – moves only one step the second tips ! * A quick corretion of 8Hz is also possible witch push of „R” button for 1 second or longer. To complete the setting time – press „S” button. * You notice that after this Action it means – after pressing the „S” button – two Watches will start displaying the current (proper) seconds. Analogue watch tips will quickly catch up due to a virtual reset – and they will find the right time … Since then both the digital watch and the analog watch show the same time. the right time ! I hope we helped a little. To set Calendar check page How to set Calendar. Check also How to set Alarm Time . 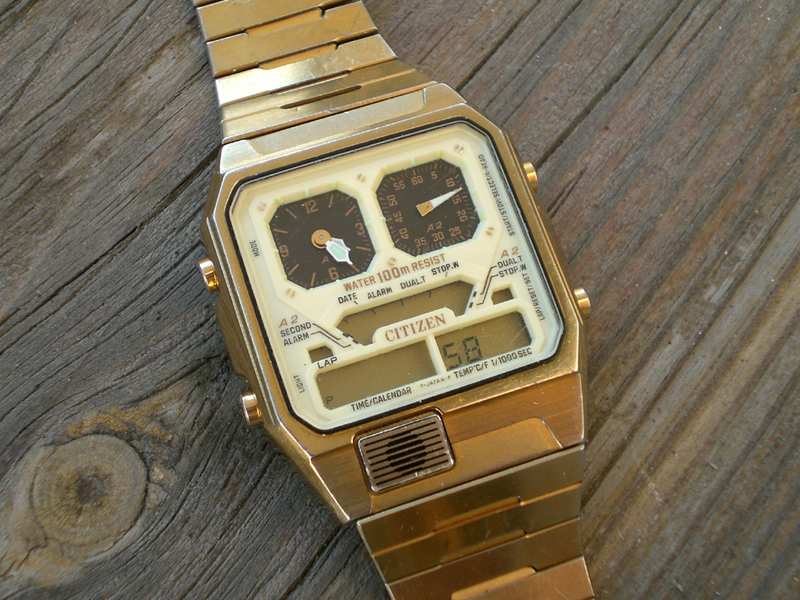 Sure to see Vintage LCD Watch Forum. Helpful info. Fortunate me I found your web site accidentally, and I am stunned why this accident did not took place earlier! I’m glad it helped you a bit. I just added – How to use Digital and Analog watch, How set Alarm ON , Chime ON, change type Thermometer, How to identify the Caliber and much more …..
I’m glad it helped you a bit. 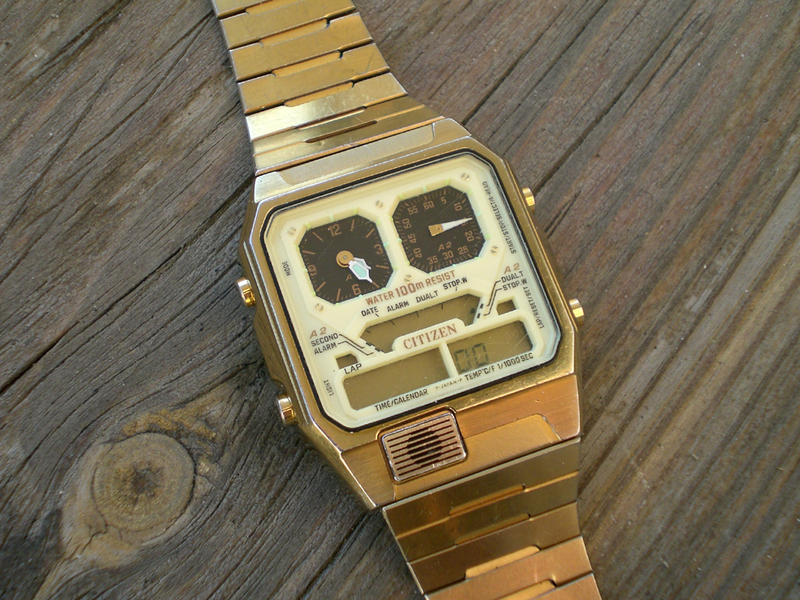 Website is regularly updated, check – How to use Digital and Analog watch, How set Alarm ON , Chime ON, change type Thermometer, How to identify the Caliber and much more …..
up here CITIZEN Ana Digi Temp | Website dedicated to old LCD Watches. I’m glad that you’ve come to this website and I could help you ! 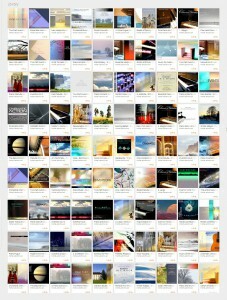 Webite is new and is still replenished up to date. Cooming soon many interesting facts about Ana Digi (never before published), my Facebook & Google plus ! Come back soon, thank you for visiting, suggestions…Greetings. 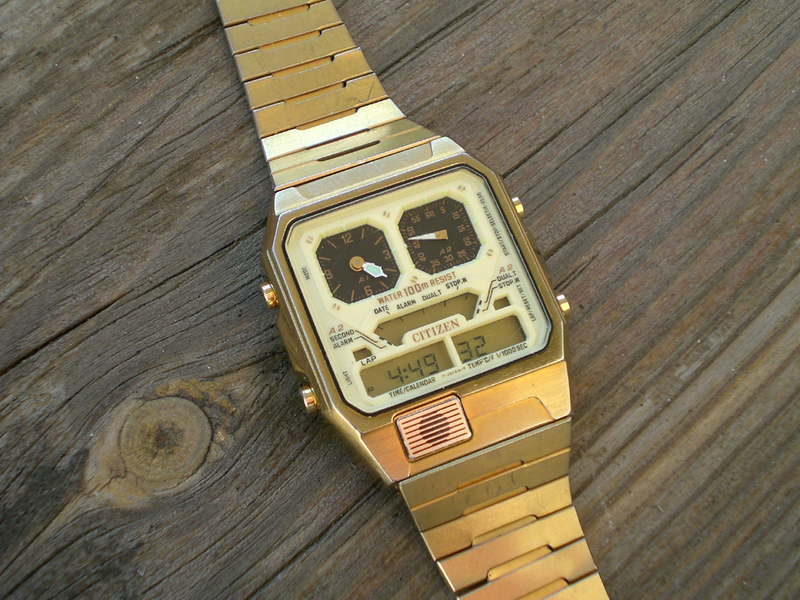 I can’t seem to get my watch to make a sound despite setting it to charm or alarm. Do you know what that might be please. If you turn on alarm or chime (and is a visible symbol of AL or CHIME) and still no sound ! The damage to the watch (circut board or CPU) is really unlikely. The cause may be the lack small coil springs in the middle of the watch. 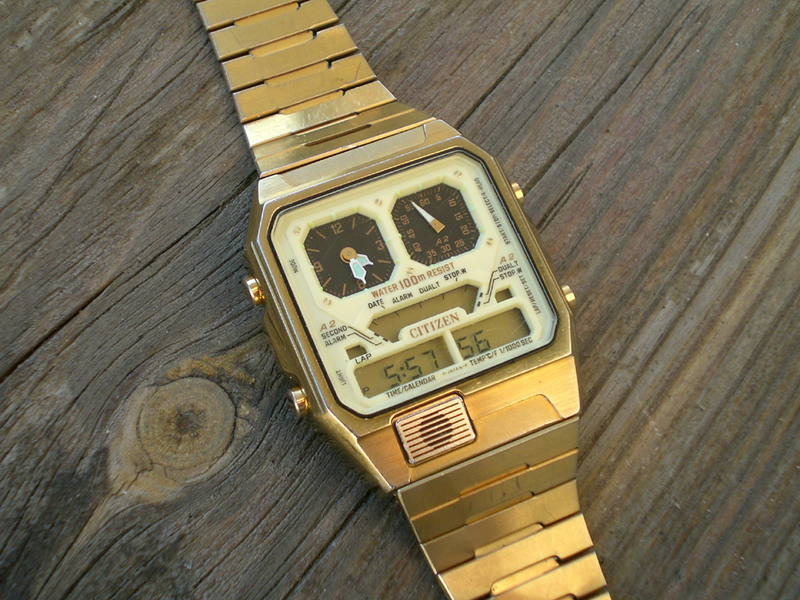 It is very small, and can fall out because it is not attached to the watch. The coil spring is the contact between the clock and speaker,also check the metal plate on the battery – should slightly protrude – like in this picture. These two contacts – I pointed out in the picture – they supplied the alarm signal to the speaker ! Open the watch – If there are no springs – take it to a watchmaker, he should find replacement or browse the springs in another watch…I know that such Casio springs are of the same diameter – you only need to cut – because they are longer. Remember that it sticking out a bit like the picture. Before closing back of the watch – coil springs should already touch the speaker. If it still does not work, post respond comment or email to me. 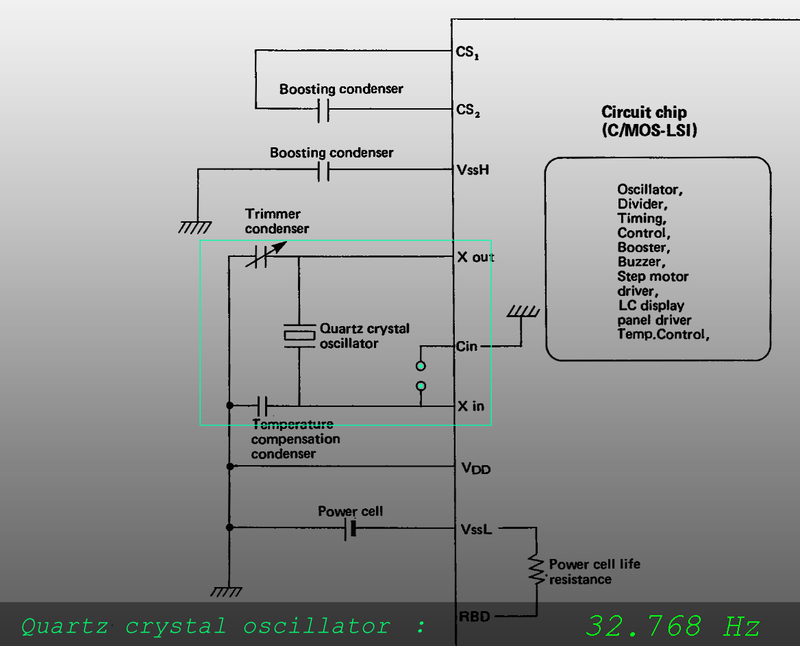 We’ll try to check the watch using the control points and voltmeter. Wow, marvelous blog layout! How long have you been blogging for? you make blogging look easy. The overall look of your web site is wonderful, as well as the content!. Thanks For Your article about CITIZEN Ana Digi Temp & . Wow, wonderful blog layout! How long have you been blogging for? you make blogging look easy. The overall look of your site is fantastic, let alone the content!. Thanks For Your article about CITIZEN Ana Digi Temp & . Wow, wonderful blog layout! How long have you been blogging for? you made blogging look easy. The overall look of your website is excellent, let alone the content!. 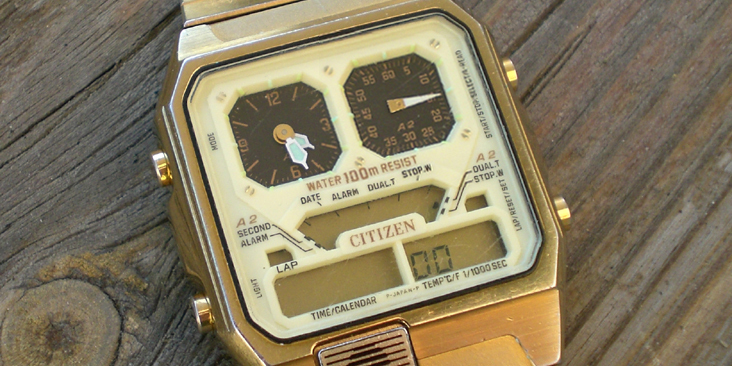 Thanks For Your article about CITIZEN Ana Digi Temp & . to shoot you an e-mail. I’ve got some ideas for your blog you might be interested in hearing. Either way, great blog and I look forward to seeing it improve over time. Wow, superb blog layout! How long have you been blogging for? you made blogging look easy. The overall look of your web site is great, as well as the content!. 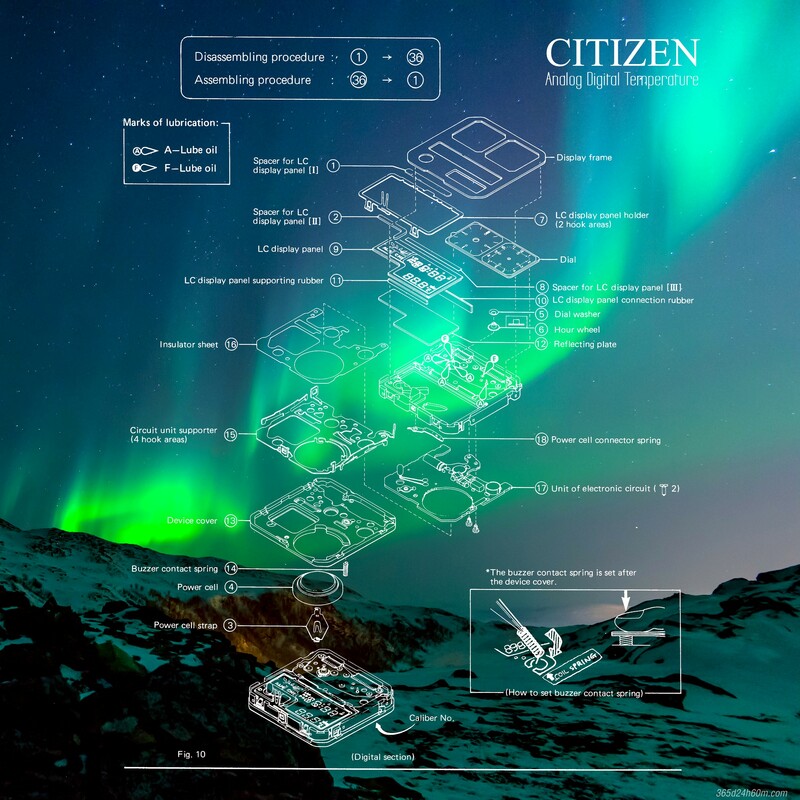 Thanks For Your article about CITIZEN Ana Digi Temp & . Hi! Your place is valueble for me. Thanks! Excellent web site. 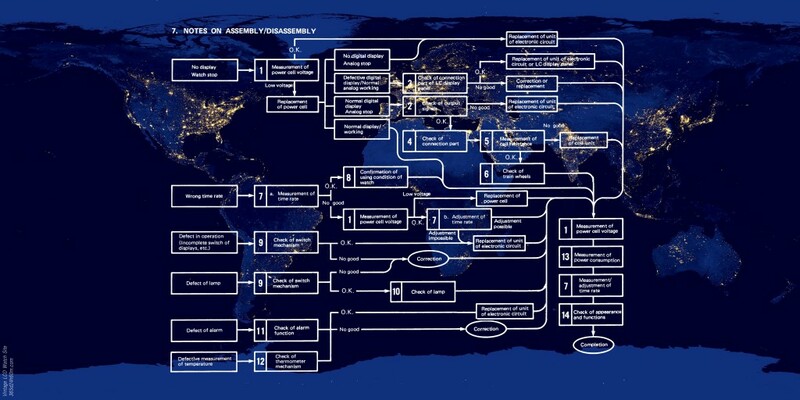 A lot of helpful info here. I’m sending it to some friends ans also sharing in delicious. of writing is genuinely good, every one be capable of easily know it, Thanks a lot.